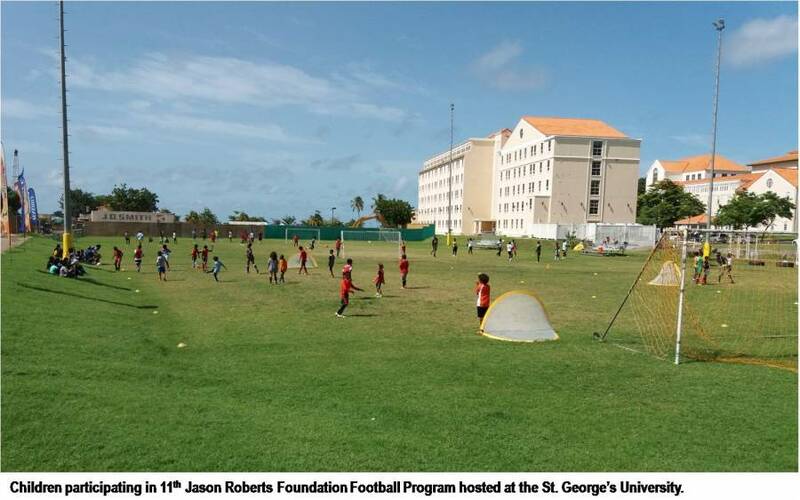 Nine residents of the Child Protection Authority’s Father Mallaghan’s Home for Boys, were among the almost 200 children who benefitted from 3 weeks of fun filled football training at the St George’s University (SGU) Campus. The free ‘summer’ programme was organised by The Jason Roberts Foundation (JRF), a charity group that has been serving Grenada for the past 11 years. The aim was to provide a platform for children to develop their sporting abilities while engaging in healthy social interaction. “What we realised was that there really wasn’t a programme in place during the summer months to engage the kids in sporting activity, so we’ve decided that football is the sport that would have the widest reach,” said Andre Patterson, Chairman of the JRF in Grenada. This year the foundation hosted the training on the SGU playing field as a means of giving the children an opportunity to see what university life looks like, and hopefully be inspired to pursue further studies in the future. “There are kids that do not normally get the chance to come to True Blue to see the campus. Who knows, maybe 1, 2, or 20 of them might decide that this is where they want to go when they finish senior school,” the chairman said. Although the foundation and the Father Mallaghan Home have collaborated on initiatives in the past, this is the first time the foundation has directly engaged the home to participate in the football programme. The chairman says it definitely would not be the last, now that the home has relocated from St Mark to St. George. “Now that they are closer to where we would be running our programmes, we would offer them the chance to be part and interact with other kids whose backgrounds are different from theirs. Hopefully it would give them an opportunity to change the way they think, the way they see things and make changes for the better. Any way that we can help, anywhere there is a need, if we can provide education, mentoring, seminars to help, then we’ll do it,” Patterson said. The Jason Roberts Foundation was established in 2007 by Grenadian former professional footballer, media personality and social activist Jason Roberts as a means to put something back into the community he came from, and to underpin his belief in equal opportunities, rights and representation for individuals regardless of background or circumstance. The programme ran simultaneously on mainland and on the sister isle of Carriacou from 10 to 28 July 2017.